Photojournalist Kris Arciaga visited Camp NAWIC on Tuesday, June 28. His story aired on KPBS TV's "Evening Edition" newscast. Please watch Kris's story about this year's program featuring our campers. 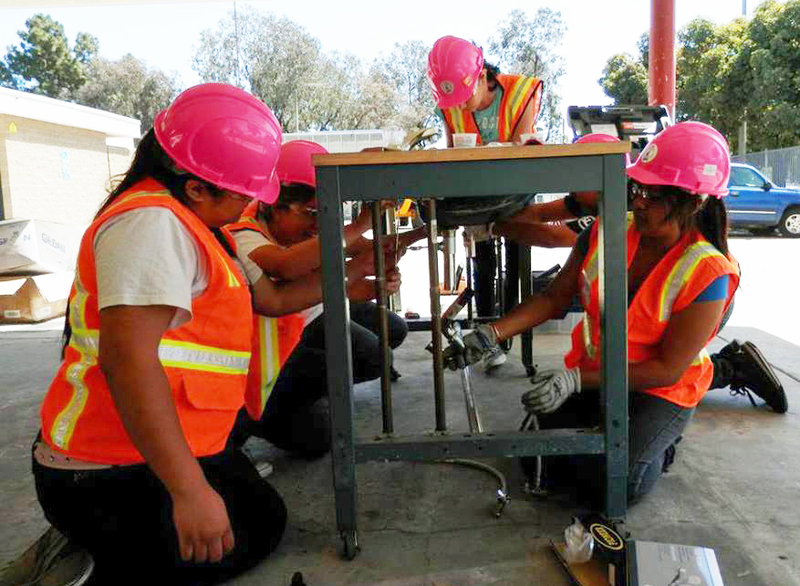 (San Diego) – High school girls get the opportunity to learn about careers in construction through Camp NAWIC, a hands-on free summer day camp hosted by the San Diego Chapter of the National Association of Women in Construction. Camp NAWIC celebrates its ninth year of camp, scheduled the week of June 27 through July 1 at the Kearny High School of Engineering, Innovation and Design in San Diego. During their week at Camp NAWIC, girls will be divided into two groups. 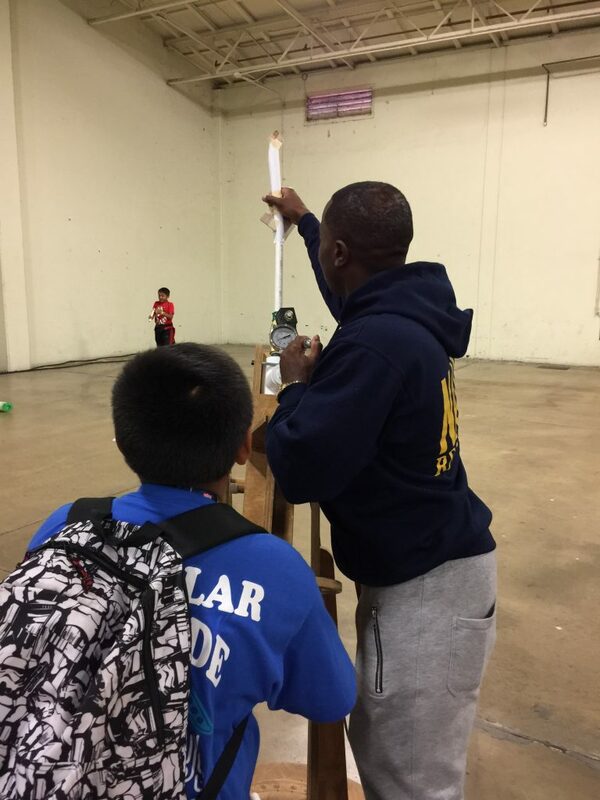 First-time attendees, or “apprentices,” will learn the basic skills of masonry, electrical, plumbing, sheet metal, solar energy, and surveying. Returning campers, or “journeywomen,” will refresh their skills and then participate in a hands-on building project. This year, the journeywomen will construct a shortage she which will be donated to a pre-school/kindergarten program. Camp activities also include hands-on heavy equipment activity and more. Prior to the start of skill courses, all Camp NAWIC participants will attend four hours of safety training and pass a written exam. Safety briefings will take place daily at required meetings for participants at all levels. Since inception, Camp NAWIC apprentices and journeywomen have received coaching in ten disciplines: Carpentry, Concrete, Electrical, Heavy Equipment Operation, Landscaping, Masonry, Painting, Sheet Metal, Surveying, and Tile Setting. 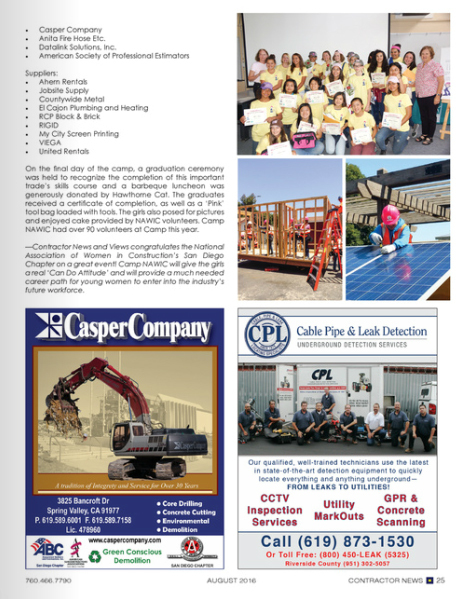 The 2016 Computer Aided Design (CAD)/Design or Hand Drafting Competition sponsored by the San Diego Chapter of the National Association of Women in Construction (NAWID) challenged 23 San Diego County high school students to produce creative designs, demonstrate craftsmanship and successful problem solving through preparation of architectural drawings. This year’s CAD/Drafting Competition project required students to design a small 7,500 square foot grocery store. Competition judging took place at the Associated Builders and Contractors San Diego office in Poway, California. Judges from all phases of the construction industry reviewed and scored completed drawings submitted by 23 students from San Diego County High Schools. Project drawings must include at minimum a floor plan, exterior elevation and site plan and placement of structure. Local winners move on to national level competition, where they receive additional monetary prizes. Entries were evaluated for detail, accuracy and originality of work. 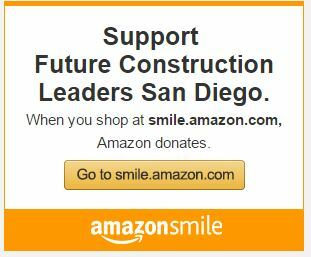 The competition introduces students to the construction industry in a positive and challenging manner, while fostering a sense of self-worth and building confidence. Mentoring programs between students and educators throughout the process are encouraged. The three winners, their guests and their instructors were invited to attend the annual San Diego NAWIC Anniversary/Awards Dinner where they were recognized and presented with their prize money and awards. We wish all three good luck as they move on to national competition. Kenton Ahrentzen, Harper Construction Company, Inc.